Keep your feet dry and super stylish at music festivals with our great selection of festival wellingtons. Available in a range of styles and patterns with options for both men and women. We also stock wellington storage bags and liners to keep your feet warm in colder conditions. For those who like wider fitting calves on their wellies, we have boots with adjustable calf gussets, which can be altered to provide a more comfortable fit. 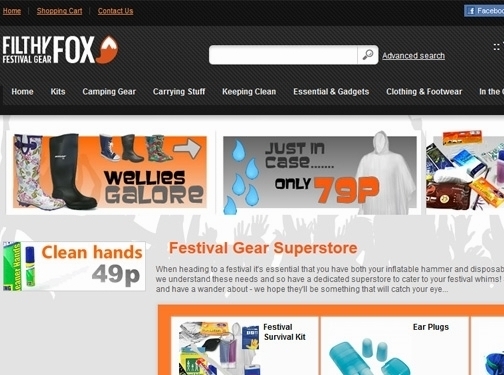 UK (Leeds) based company providing camping clothing, equipment and accessories for sale. Website includes e-commerce facilities, delivery and returns information, terms and conditions, full company contact details. Company website has been online since 2007 according to web.archive.org.